I am tired of scrolling through all the objects such as tables, Stored Procedure and View to find an object. Sometime I need to script Stored Procedure to see the definition and it take me couple of minutes just to find the required Stored Procedures as we have 100,s of Stored Procedure. Is there a way I can filter objects in SSMS? 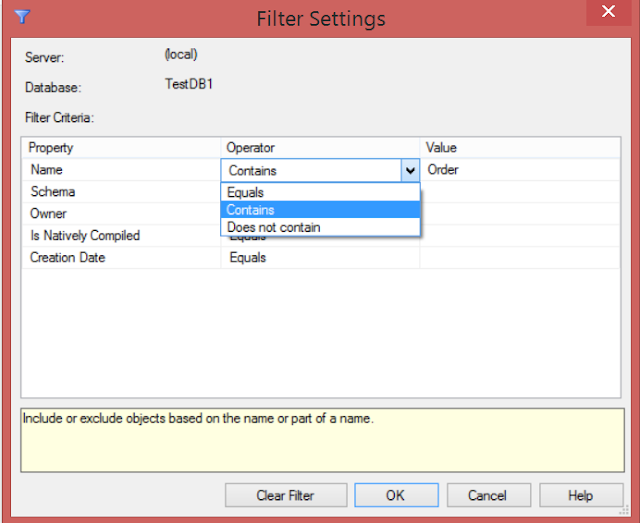 SQL Server Management Studio(SSMS) let us filter objects such as tables. Stored Procedure and Views. It really helps to get to object quickly in case when you have a lot of objects in your single database. Here is how you can filter the objects. Go to Database and then to Tables, Views or Stored Procedures under Programmability and then Right click. In next windows, we will be able to provide filter criteria. We can filter when equal, contains or not equal as you can see below. Once filter is applied, you will see only object which qualify filter criteria. 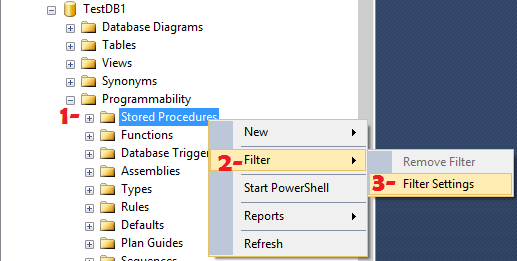 Once you are done and would like to see all the object again or change filter criteria, Right Click on Tables, Views or Stored Procedures and then go to Filter and then hit Remote Filter or Filter Setting to change current criteria.